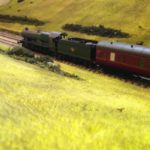 If you want a fun and interesting model railway then you’ll want your Hornby trains hauling wagons up hills. Here’s how to work out the vital length and gradient numbers needed to start building inclines. Watching tiny trains trundling around a model railway is fun but if the track is just flat it can get boring before long. But seeing your trains hauling up hills, now that’s something else! But building inclines isn’t just a matter of titling some track upwards to the height required. Given the small amount of surface area on a train wheel that comes into contact with the rails there’s actually little traction that can be brought to bear when climbing a hill. If the slope is too steep there won’t be enough traction to compete with the downhill drag the engine will stop or even roll backward! In a discussion on this very subject on the Bachmann trains forum Doneldon noted that building inclines to prevent trains from stalled and backsliding means giving “careful attention to track and wheel gauge, rolling stock clearances, transition curves, moderate grades, electrical integrity, precise coupler adjustments and adherence to correct weight for your rolling stock” (see original post here). Luckily others have been here before. What’s needed is to reduce the incline to a gentle slope. You can see this in real railways where the approach to hills is done gradually over many miles. The problem is that this requires long stretches of track. On real railways this is expensive and ingenious designs have been developed over time to provide the length of track required without the distance. These include spirals that work their way around hills and mountains, zig-zags and horse-shoe designs. And on our model railways — where space is a premium — it’s even more of a problem. This predicament has been tackled and the optimum ratio for rate of climb that trains can manage while eating up the minimum distance of track is well established. And a proven ratio has been figured out. 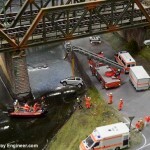 This tried and tested ratio for model railways is a grade of 1 in 50. Or 1cm increase in height over 50cm of horizontal travel. 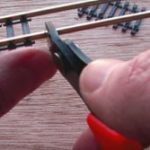 You can use any unit distance as long as the same is used in both dimensions — eg 1inch over 50inches — and as such this applies for N, OO and HO scale layouts. Did you know? The steepest prototype mainline railway in Great Britain is Lickey Incline, south of Birmingham, with a bonkers gradient of 1-in-37.7 (2.65%). The line through the Luxulyan Valley in Cornwall, which I’ll be featuring as a spur on my layout, reaches 1 in 37 in places but only for short stretches. 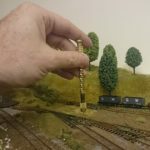 So building your layout is just a case of working out the height of the vertical to be reached and multiplying this by 50. This is how long the track will need to run to go from the “ground” level to the top of the hill or bridge needed. 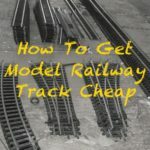 If you want the track to climb from baseboard level to a bridge that runs over another section of track measure from the top of bottom rail to the top of a rail on the bridge. On my layout this is will be 5cm. Multiple this by 50 and I need to start the incline 250 centimetres from the bridge, creating gentle rise to the crossing. This ratio is called the grade and is usually expressed as 1 in 50, or as a decimal percentage (divide rise by the run, eg 1/50 and multiply by 100, giving 2%). In experiments, I’ve had modern locos pull approximately 10 wagons or five passenger cars up such a grade. For longer trains, do what the real railways do and double up or even triple up on locomotives. Steeper inclines can be used but the steeper you get the more chance of problems emerging. 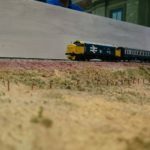 The consensus from experienced railway modellers is not to go beyond 1 in 40. With 1 in 30 being the absolute maximum considered by modellers on Model Railway Forum and the Anyrail forum (here and here). 1 in 30, by the way, equates to 3.33% – compare this to the 2.65% Lickey Incline figure above to get an idea of how models compare to the real thing. These calculations assume you have a height you want to reach and need to know the run distance you’ll need to get there. Rather than repeat some simple maths, take a wander over to the Credit Valley Railway Company who has written an excellent article on the calculations needed. I currently have a layout that cimbs and descends 6-1/2 ” in 49″. 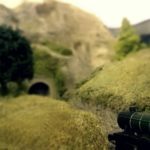 It`s in O gauge and is the vital parts for my disapearing tunnel. My mth engine is a 4-6-0 and hauls 17 cars around it flawlessly. Many thanks , will look at other articles you have posted, thanks. Thank you for taking the time and trouble to help others. This item was very useful – I will be reading some more of your posts. 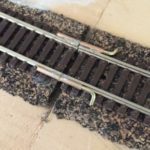 Regarding the bridge over another track – I assume the 50mm track top to track top dimension is for N gauge… what would you suggest for OO? Also – any tips for the all important transition from level track to the incline? BTW Thanks also for the links to other sites dealing with the subject.